The auditors now oblige the College to enact stringent controls over I.T. security. A key component of these controls will be the implementation of a unified login system. 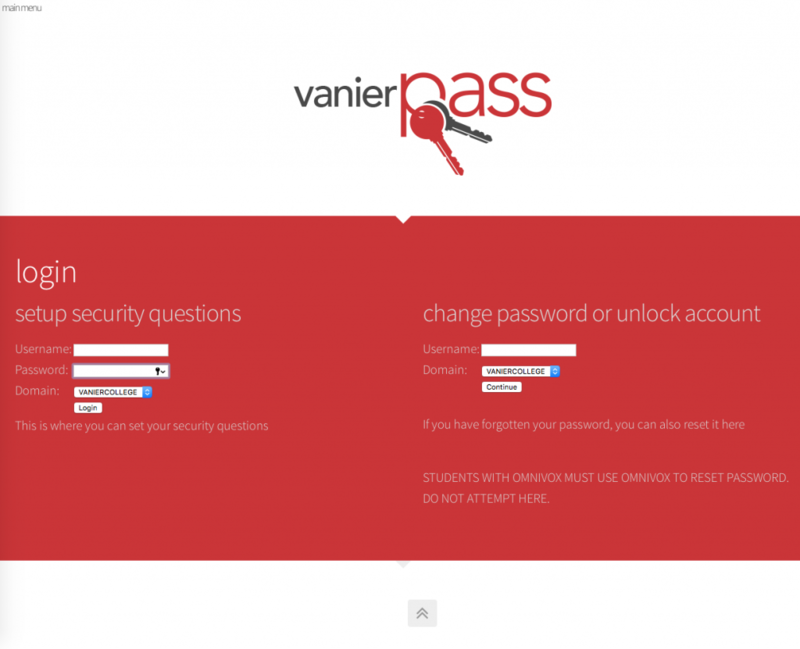 A single VanierPass login account will provide access to email, web services and Vanier College networks, eliminating the need for multiple usernames and passwords. set 2 personal security questions. perform password resets at specified intervals. After setting your security questions, you will be able to reset your password or unlock your account immediately without placing a call to the Helpdesk and waiting for their response. Once you see the login screen below, enter your username and password in the boxes provided on the left hand side of the screen under Web Enrollment Login. For employees, it is your VanierPass username associated with your Vanier email (the part before “@vaniercollege.qc.ca). Click on the Login butto. Once you have logged in, select a minimum of two security questions from the Question: field’s pull-down menu. Once you have selected your question, type the answer into the Answer: field. Click Add to submit that question. If you change your mind and wish to remove your question, click on the Delete button. After adding your first question, you are prompted to add your second question. Select your second question and click on the Add button. Your security questions have now been set. One you are finished, click on logout, or simply close the browser window. how often do you have to change password? Your password must be changed every 90 days, and you cannot repeat previously-used passwords. For increased convenience and security, we recommend using a password manager (such as 1Password or LastPass) that can generate complex passwords, and save them for you. Navigate to reset.vaniercollege.qc.ca or click the Self Service link on the left. Once you see the login screen below, enter your username in the box provided on the right hand side of the screen under Change Password / Unlock Account. Please note that in order to proceed, you must have previously set your security questions as described above. For students, your account username is your student number, while for employees, your VanierPass username is the part before “@vaniercollege.qc.ca for your Vanier email. Once you see the screen below, enter the answers to your security questions. To reset your password, type in your new password. Retype it for confirmation and click on the Change Password button. If you answered your security questions incorrectly, you will receive an error message. Instructions on how to deal with this situation are found in the help section of this page. Don’t forget to update your password on any mobile devices you have connected to either email or WiFi! birthdays, relatives’ or pets’ names or nicknames. and can not be a password you have used before. If you mistype your password 3 times, your account is locked for the next 30 minutes. This is to protect you from someone guessing your password. 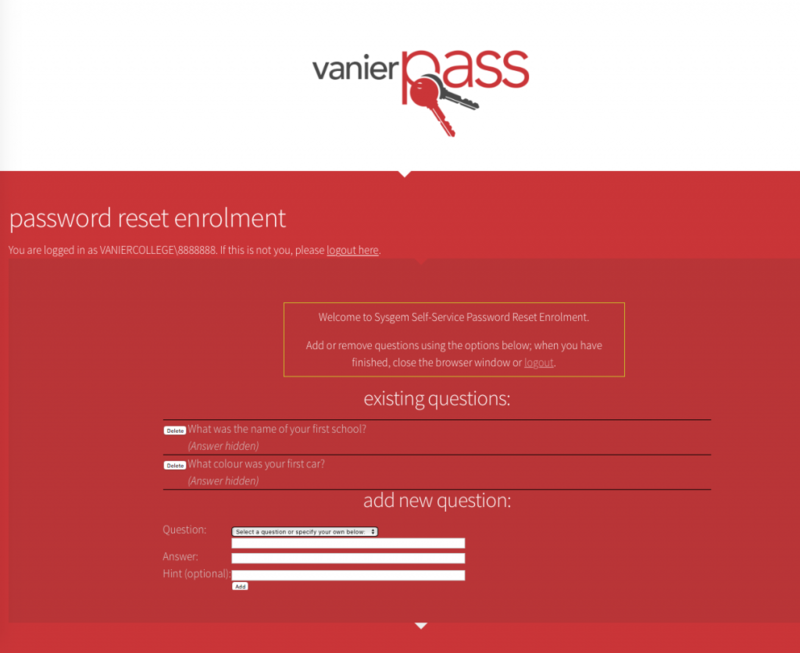 If you don’t want to wait half an hour to use your account, you need to unlock it using the VanierPass Utility. Once you see the screen below, enter the answers to your security questions. You now have the option of unlocking your account or resetting your password. If you wish to unlock your account, click on the Unlock Account button. If you answered your security questions incorrectly, you will receive an error message. If you answered your security question incorrectly, you will see the following screen. You will be brought back to the initial screen so that you may re-enter the answer to your security question. If you have forgotten the answer to your security question, please contact the Helpdesk for assistance. If you mistype the password when you attempt to confirm it, you will see the following screen. You will be brought back to the initial screen so that you may retype your password. If you enter a weak password, as described in the “What’s a weak password” section of this FAQ, you will see the following screen. You will be brought back to the initial screen so that you may choose a strong password. 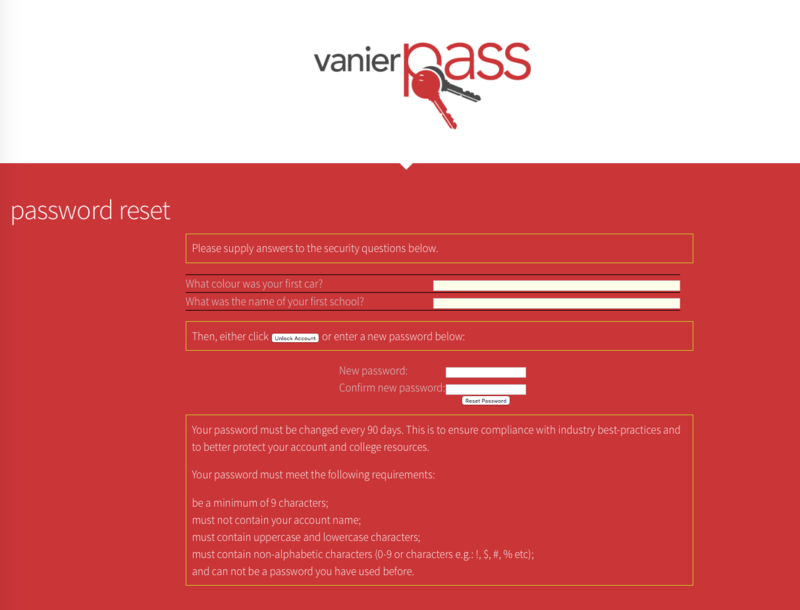 If you still have issues using your VanierPass after attempting to unlock or change your password using the Utility, the ITSS HelpDesk can help.